Image caption Cheryl Giovannoni: "We try to protect girls more than we should." Parents and teachers should not "wrap girls in cotton wool", an independent schools' leader has said. 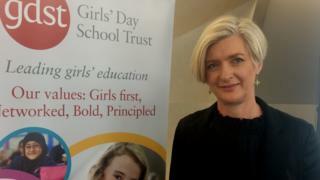 Girls were not victims and were stronger and more feisty than they were often given credit for, said Cheryl Giovannoni, chief executive of the Girls' Day School Trust (GDST). Ms Giovannoni said girls should be encouraged to take the sorts of risks boys were more likely to take. They should also be taught to say no and not always be willing to please. Speaking at the GDST's annual conference in London, Ms Giovannoni said a picture had been painted of girls feeling anxious and unhappy "without any of the coping skills they need to thrive in today's world". "And don't get me wrong, I know that some girls are," she said. "But overall, it's not a picture that rings wholly true for me, nor one that we should succumb to as yet another reason to wrap girls in cotton wool and protect them from a deeply evil world where they are preyed upon mercilessly. "Not all girls are victims. I believe that many girls are far stronger, resilient, opinionated and feisty than they are given credit for." Talking to journalists, Ms Giovannoni said parents often treated their sons differently from their daughters. "Parents wouldn't hesitate to allow a boy to get an Uber home from a party but they are more reluctant to allow their daughters to. "They are overprotective, they think boys can look after themselves - they don't necessarily think that girls can." Ms Giovannoni said girls also needed to be confident about saying no. "It's about not always being willing to please and to get approval. We have to make sure that people feel comfortable saying no when they believe that they are uncomfortable." Young girls would eventually have to look after themselves, she added. "Girls go off to university and if you haven't helped them to be confident and resilient and to have coping mechanisms they are going to university and they're going to have to cope on their own anyway." GDST represents 24 independent girls' schools and two academies in England and Wales, educating 20,000 students and employing 3,700 staff.